Dr Andrew Garrett’s main area of expertise is the markers of fatigue in temperature regulation during exercise and he is an Associate Member of the Hull York Medical School. He completed his undergraduate and postgraduate degrees at the University of Wales Institute Cardiff and the University of Loughborough respectively. His MSc thesis investigated intermittent exercise in hot and cool conditions. His PhD work was funded by the Australian military and based at the University of Otago in New Zealand. He examined the induction and decay of heat acclimation primarily focused on the response of the fluid-regulatory system in hot conditions (Induction and decay of heat acclimation). He has held academic positions at Manchester Metropolitan University, University of Waikato (New Zealand), University of Hertfordshire and more recently a Visiting Research Fellowship at the University of Otago in New Zealand. Dr Garrett’s recent work has focused on the effectiveness of short-term heat acclimation with dehydration, on intermittent and continuous exercise, with moderately and highly trained athletes. This work has culminated in several publications in the European Journal of Applied Physiology, American Journal of Human Biology and a review in Sports Medicine. In this research theme he has a number of national (Dr Neil Maxwell, University of Brighton; Dr Paul Castle, GlaxoSmithKline and Dr Andrew Weller, QinetiQ-British Military) and international collaborations (Associate Professor Jim Cotter, University of Otago, New Zealand). Dr Garrett has recently received a João Havelange Research Scholarship (FIFA) for 18,000 US$ to support research into the health and well-being of female participants in heat stress conditions. In the research theme of chronic disease Dr Garrett has collaborated with Dr Enric Vilar (Renal Research Unit, Lister Hospital in Stevenage) investigating metabolism in kidney dialysis patients and published article in the Journal of Renal Nutrition; and Dr Carmel McEniery (Cambridge University), on the cardiovascular health screening of young, ethnic populations. This work was presented at the European College of Sport Sciences. He is currently collaborating with Dr Thozhukat Sathyapalan of the Hull York Medical School investigating insulin absorption in diabetes patients during heat stress. They have published similar themed environmental stress work to the journal Frontiers in Endocrinology. He has presented his work at several international conferences such as the American College of Sports Medicine, Australian Physiological Society, European College of Sport Sciences and the International Conference on Environmental Ergonomics. He was a member of an invited symposium team at the Pre-Olympic conference in 2012 and it was entitled ‘Rethinking the traditional heat acclimation strategy for Olympic and Paralympic athletes’. He regularly reviews articles for academic journals and is a textbook reviewer for Taylor & Francis publications. He is chair of the School of Life Science ethics and a member of the Faculty of Health Sciences ethics committee. He has held PhD and MSc external examiner positions with the Universities of Brighton, Bedfordshire, Hertfordshire and Hull University. Furthermore, he was an expert panel member for the validation of a new MSc at Anglia Ruskin University in Cambridge and continues as an external examiner. 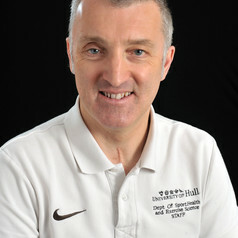 He is a Senior Fellow of the Higher Education Academy (SFHEA) and a professional member of the British Association of Sport and Exercise Sciences (BASES). Dr Garrett is a competitive triathlete and competed in the 1990 Commonwealth Games in New Zealand. He is a keen athlete having competed in the London and Edinburgh marathons. He recently competed in the Hever Castle 1/2 Iron Triathlon and the International Triathlon Union series in Leeds albeit moving a lot slower than in his earlier athletic career!!! !